We are excited to announce the release of a new book written by the co-founder of Shelter and Rain. Courageous and Free is for those in a journey of recovery and anyone who walks beside them. How Do You Speak to Me? Are There Walls I Have Put Up? Do You Care About My Struggles? What Is Your Love Like? How Does Your Love Encounter Me? Will You Heal My Heart? Is There a Lie That I Am Believing? Is There a Vow That I Need to Confess? Is There a Soul Tie That Needs to Be Broken? What Does It Look Like to Live Courageous and Free? What is Courageous and Free About? 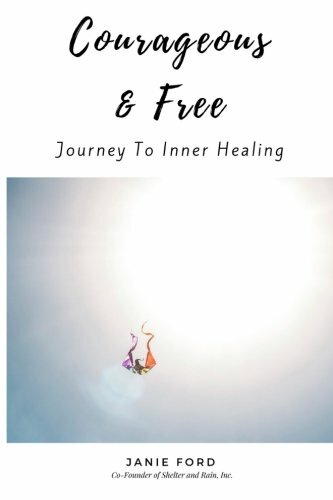 Do you desire inner healing but are unsure of what steps to take? You were not meant to sit on the sidelines and watch others come alive. Courageous and Free is an invitation to step out of the cycle of hurt and disappointment you carry. Be invited into an authentic connection with God. Have permission to ask questions that unlock your worth and identity. Heal and experience breakthrough from emotional pain, negative self-talk, and personal struggles. Courageous and Free is for those who desire deeper levels of inner healing. If you are on a journey to recovery or desire to walk alongside someone who is, then this book is for you! This listening prayer guide is intended for individuals or small group study. The world is waiting for you to embrace your true purpose and identity. Let Courageous and Free lead you there. Often our perception of love is developed through our human interactions and are not accurate interpretations of what true love is. Someone may have promised us unconditional love and then required that we pay in some way for the affection, protection, and even comfort that we received. Perhaps love was a reward for accomplishing a list of rules or expectations. Achievement-based love is always performance driven and can fuel a perfectionist spirit that hinders us from receiving the love God has given to us. Those in our lives may even have abused us in the name of love. The word “love” was God’s word first, so He gets to have the first and final say.